Dr. Kalva is a Clinical Fellow in the Division of Cardiovascular Imaging and Intervention; Dr. Blake is an Assistant Radiologist, Division of Abdominal Imaging and Intervention; Dr. Sahani is the Director of CT, and an Assistant Radiologist, Division of Abdominal Imaging and Intervention, Department of Radiology, Massachusetts General Hospital, Boston, MA. Magnetic resonance (MR) contrast agents have made a significant impact in the use of MR imaging for various clinical indications. Since the introduction of the first MR contrast agent in 1988, there has been a tremendous increase in the number of contrast-enhanced examinations. Today, 40% to 50% of all MR examinations use contrast agents. 1 MR contrast agents contain paramagnetic or superparamagnetic metal ions that affect the MR signal properties of surrounding tissue. These contrast agents are used primarily to increase the sensitivity of MR for detecting various pathological processes and also for characterizing various pathologies. In addition, the contrast agents are used for depicting normal and abnormal vasculature or flow-related abnormalities and pathophysiologic processes like perfusion. Contrast agents may also find further novel applications at high field strengths (>1.5T). The resulting capability for shorter MR image acquisition times can allow functional studies, such as MR perfusion, to be performed with better time resolution. In this article, we review various MR contrast agents in clinical use and in development and their current and potential applications. MR contrast agents are primarily classified into two groups based on their organ specificity-tissue-specific contrast agents and non-tissue-specific contrast agents. As the name implies, tissue-specific contrast agents are targeted at a specific tissue type (eg, reticuloendothelial cell-specific or hepatocyte-specific) or organ (eg, blood-pool agents for the vascular system or enteral agents for bowel). The non-tissue-specific contrast agents have an initial short intravascular distribution and then distribute in the extracellular space throughout the body without any selective accumulation in an organ. These are the first-generation MR contrast agents. Essentially all these agents have gadolinium (a paramagnetic metal in the lanthanide series) as the active component attached to various complexes that determine their charge, pharmacokinetics, biodistribution, and toxicity. They are classified into four groups depending on the charge (ionic or nonionic) and the biochemical structure of the complex (macrocyclic or linear) 2 (Table 1). Gadolinium is a paramagnetic agent because of its seven unpaired electrons. This strong paramagnetic effect disturbs the relaxivity of nearby water protons, resulting in a decrease of both T1 and T2 relaxation times. The reduction in the T1 relaxation time is greater at low gadolinium concentrations than is routinely achieved clinically; this is seen as increased signal intensity on T1-weighted spin-echo or gradient-echo images. These complexes are of low molecular weight and weakly bind to proteins and thus circulate within the intravascular space for a very short period of time before leaking into the extracellular space. They do not cross the normal blood-brain barrier. Thus, these agents are suitable for imaging disease processes that disrupt the blood-brain barrier, such as cerebral tumors or cerebral infectious processes. 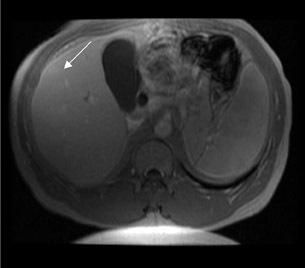 They are also helpful in dynamic imaging to assess the preferential enhancement of certain pathologic processes, such as hepatocellular carcinoma or renal cell carcinoma. Almost all of these agents are excreted through the kidneys without any significant metabolic change in the body. These agents are found to be safe in patients with renal impairment. No clinical data exists regarding the safety of these agents during pregnancy, and none of these agents is approved for use during pregnancy. Though uncommon, the known adverse events with gadolinium chelate administration include headache, nausea, taste disturbance, dizziness, and paraesthesia. Table 2 lists available gadolinium-based contrast agents along with their current approval status. None of these agents is currently approved for MR angiography (MRA) or MR arthrography. Though all of these agents behave similarly once injected, there are certain differences among these agents in terms of biodistribution and pharmacokinetics that allow us to choose a particular agent for specific clinical indications. For example, gadobenate dimeglumine (Gd-BOPTA; MultiHance, Bracco Diagnostics Inc., Princeton, NJ) is a preferred agent for MRA because of its weak protein binding that results in a prolonged intravascular distribution compared with gadopentetate dimeglumine (Gd-DTPA) (Magnevist, Berlex Laboratories, Wayne, NJ). Similarly, the partial excretion (50% to 60%) through the hepatobiliary system makes both gadoxetic acid (Gd-EOB-DTPA) and Gd-BOPTA good choices for hepatic imaging. These two agents behave similarly to other gadolinium chelates during the initial phase and thus are helpful in assessing tumor enhancement and characterization. During the later phases, they selectively increase the signal intensity of the liver (via hepatocyte uptake), thus aiding in the detection of small tumors. 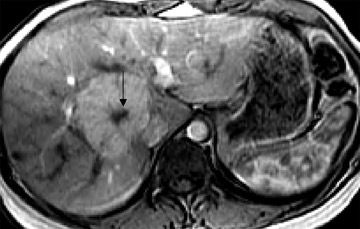 This is dependent on the degree of differentiation of the tumor, as well-differentiated hepatocellular carcinoma may take up the contrast and become less conspicuous. However, these agents are best utilized for detection of metastases. 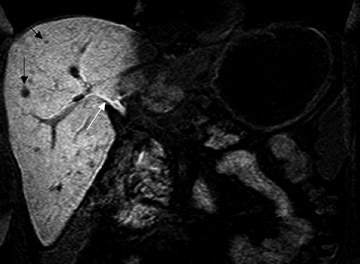 In addition, because of biliary excretion during the delayed phase, the biliary ducts can be mapped well using T1-weighted images (T1-weighted MR cholangiography). Although they are now available in Europe, neither of these agents is yet approved for clinical use in the United States. As previously mentioned, these contrast agents are targeted to specific organs or tissues so there is a significant positive or negative enhancement of those organs or tissues after the administration of these contrast agents. Various agents are currently available and are discussed according to their organ/tissue specificity. The liver-specific MR contrast agents are targeted toward hepatocytes or reticuloendothelial cells and provide either positive or negative enhancement after intravenous (IV) administration (Table 3). Hepatocyte-specific contrast agents include mangafodipir trisodium and two gadolinium chelates: Gd-EOB-DTPA and Gd-BOPTA. The reticuloendothelial-cell-specific agents are small particulate iron oxides-ferumoxides and ferucarbotran. Mangafodipir trisodium-- Mangafodipir trisodium contains Mn 2+ , a transitional element that exhibits paramagnetic properties because of five unpaired electrons and, thus, shortens the T1 relaxation time. It has chemical similarity to vitamin B 6 , and, because of this, it is specifically taken up by hepatocytes. However, evidence exists that metabolic products of this compound are also responsible for selective uptake into the liver, pancreas, and cardiac muscle. 7 This compound is administered via slow IV infusion over a period of 2 to 5 minutes; the effect is seen within approximately 15 minutes and lasts for 24 hours. The adverse events commonly reported include facial flushing and a hot sensation. 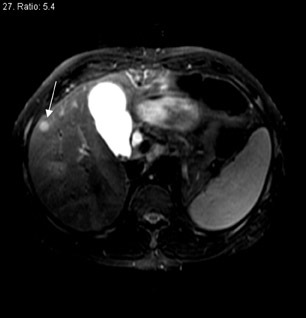 The prolonged imaging window makes this agent a good choice for imaging the liver. 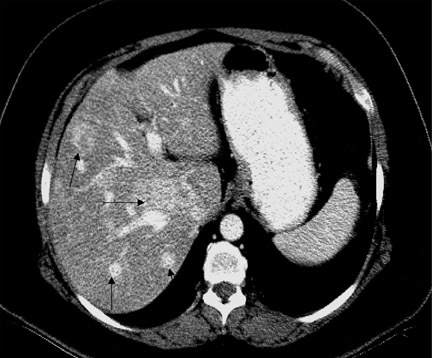 The signal intensity of normal hepatic parenchyma is increased, providing high lesion-to-liver contrast. This aids in the detection of small liver lesions. 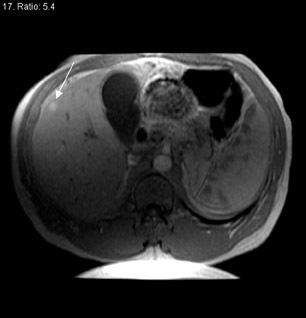 8 This agent may also be taken up by well-differentiated hepatocellular carcinoma; thus, the tumor may be masked. 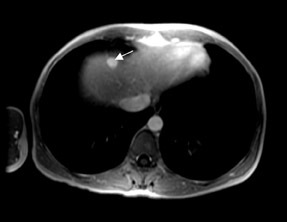 Therefore, this agent is best used for the detection of metastases (Figure 4). 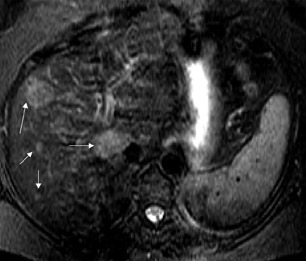 During the later phases, this contrast agent is excreted into bile (Figure 4) and provides excellent biliary ductal detail and aids in the diagnosis of various biliary pathologies, such as biliary obstruction and bile leaks. Gadolinium chelates-- Two gadolinium chelates exhibit liver specificity because of their selective uptake by hepatocytes through a carrier-mediated transport across the cell membrane. These include Gd-EOB-DTPA and Gd-BOPTA. These agents are excreted into the bile unaltered and are ultimately excreted via both urine and feces. After IV administration, these agents have an initial intravascular phase similar to other gadolinium chelates, but during the later phase, they accumulate in the liver parenchyma and increase the signal intensity of the liver. Thus, the lesion-to-liver contrast is increased, and these agents aid in the detection of small liver lesions. Similar to that obtained with any other gadolinium chelate, the initial intravascular phase helps in the characterization of the liver lesions (Figure 5). In addition, in similar fashion to mangafodipir trisodium, these agents also provide excellent biliary ductal detail during the delayed phase. Ferumoxides-- This reticuloendothelial-specific superparamagnetic iron oxide (SPIO) agent provides negative enhancement of the liver after IV infusion. Ferumoxides are made up of a central iron oxide particle-Fe 2 O 3 , a superparamagnetic compound surrounded by a dextran coating. Though the central core of iron oxide measures only 3 to 5 nm, the actual size in the circulation is approximately 50 nm because of hydration of the dextran coating. As these agents are superparamagnetic, they disturb local field homogeneity and are thus best appreciated on T2* pulse sequences. 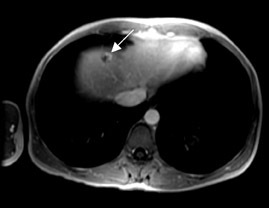 Because of this effect, these agents cause a loss of signal at the site of accumulation-ie, the normal liver turns dark. These agents need to be infused slowly over a period of 30 minutes to avoid cardiovascular effects and lumbar pain. 9 The size of the particle determines the tissue specifici-ty-small SPIOs are preferentially taken up by Kupfer cells in the liver, whereas ultrasmall superparamagnetic iron oxide particles (USPIOs) are taken up by macrophages in the lymph nodes, liver, lung, and spleen. After the intracellular uptake, SPIOs are metabolized in the lysosomes into a soluble, nonsuperparamagnetic form of iron that becomes part of the normal iron pool (eg, ferritin, hemoglobin, etc.). Following the administration of this agent, the liver (because of a homogeneous distribution of reticuloendothelial cells) enhances on T2or T2*-weighted images (ie, it turns dark), resulting in increased conspicuity of pathologic lesions that do not contain reticuloendothelial cells. It is important to note that lesions that contain reticuloendothelial cells, such as focal nodular hyperplasia, may become isointense to normal liver because of a decreased lesion-to-liver contrast ratio. 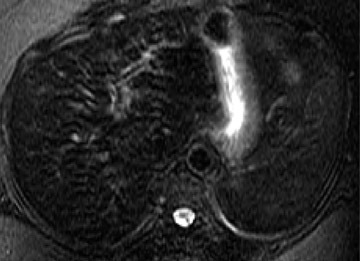 Therefore, on some occasions, a questionable focal nodular hyperplasia may be confirmed on ferumoxide-enhanced MR (Figure 6). However, because of the relative inconsistency in the amount of reticuloendothelial cells in focal nodular hyperplasia, hepatic adenoma, and hepatocellular carcinoma, such clinical use is not routinely recommended. In addition, well-differentiated hepatocellular carcinoma may also contain reticuloendothelial cells, resulting in decreased lesion conspicuity. The detection of metastases, however, is improved with this agent. 10 At high field strengths, the increased susceptibility effects exacerbate the effects of SPIO particles; these contrast agents may have newer applications, or dose adjustments may be required for existing applications. Like mangafodipir trisodium, this agent also provides a long imaging window after IV infusion, thus facilitating high-spatial-resolution thin-section imaging. These agents circulate in the intravascular space for a longer period of time than other agents and cause a significant reduction in the T1 relaxation time of circulating blood; thus, these agents are best suited for MRA. Current MR scanners provide excellent MRA with commercially available gadolinium chelates. However, simultaneous imaging of multiple regions of interest (eg, the thoracoabdominal aorta and peripheral limb arteries) is not possible. 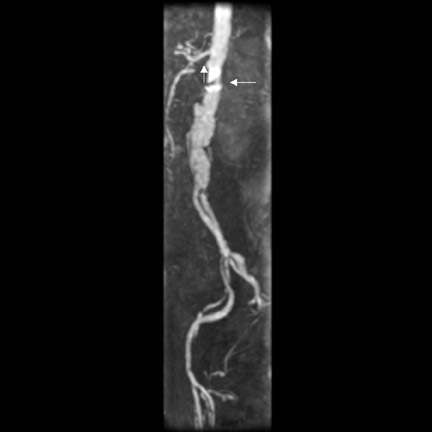 In addition, low-field MR imaging does not allow for rapid scanning of the vascular tree during the short intravascular phase of gadolinium chelates. Thus, blood-pool agents would be desirable for high-quality MRA. Several such agents are in development, but none is currently approved for clinical use (Table 4). 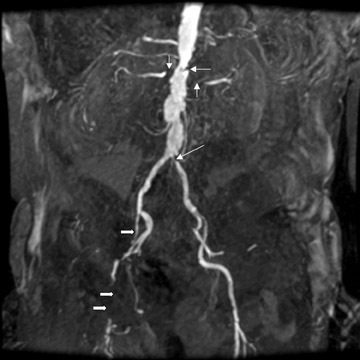 Various approaches have been taken to make the contrast agents strictly intravascular or to provide a longer intravascular phase of distribution. One of the approaches is to modify the currently available contrast agents in such a way that they become protein-bound during the intravascular phase and do not diffuse into extravascular space. Gado-fosveset (MS-325) and gadocoletic acid (B22956/1-a Gd-DTPA derivative coupled to deoxycholic acid) belong to this group of agents. Both of these agents reversibly bind to circulating albumin and remain in the intravascular space for longer periods of time. Initial clinical studies showed good visualization of the coronary arteries during the first pass and excellent MRA of other arteries, even in delayed phases. Although none of the lymph-node-specific agents is currently approved for clinical use, initial clinical results have shown much promise in differentiating malignant lymph nodes from reactive hyperplastic lymph nodes in prostate cancer using USPIOs. 14 The smaller size, compared with SPIOs, and hydrophilic coating result in a longer circulation in the intravascular space, and the particles escape rapid accumulation in the reticuloendothelial system. These particles are phagocytosed by macrophages and accumulate in the lymphatic system. Normal lymph nodes are characterized by a dramatic signal drop on T2*-weighted images after the administration of USPIOs, whereas malignant lymph nodes, being devoid of macrophages, do not accumulate iron oxide particles and maintain a high signal intensity. It takes 24 to 36 hours for the contrast agent to accumulate in the lymph nodes, thus, postcontrast imaging is usually obtained 24 hours after the administration of the contrast agent. The currently available contrast agent from this group for research use is ferumoxtran/AMI-227. Gadolinium-based agents for lymphnode evaluations are also under investigation. One of the agents, gadofluorine-M, was found to be useful in experimental animals in providing enhancement of normal lymph nodes, 15 and thus may help differentiate nonenhancing metastatic lymph nodes. There are many other tissue-specific MR contrast agents in development. Some have shown promise in imaging atherosclerotic plaque, including USPIOs and gadofluorines. The USPIOs accumulate in the monocyte-macrophages of atherosclerotic plaque, 16 and gadofluorines accumulate in the foam cells and cellular debris deep to the intima at the site of atherosclerotic plaques. 17 In addition, various porphyrin-based gadolinium compounds are also being developed for the evaluation of atherosclerotic plaques. Gadophrins, necrosis-specific compounds based on a porphyrin ring structure, are being investigated for use in assessing myocardial necrosis. 18 Tumor-specific MR contrast agents are either specific to a particular tumor type, such as the monoclonal-antibody-labeled paramagnetic and superparamagnetic nanoparticles, or are nonspecific, seeking metabolically active tumor tissue, such as the liposome-based contrast agent with specificity for glucose receptors 19 and nonspecific porphyrin-based agents that target necrosis. 20 Thrombus-specific MR contrast agents are also under investigation for better detection of intravascular clots. 21 Mangafodipir trisodium, which was developed for liver imaging, was found to accumulate in the pancreatic parenchyma and has been be clinically useful for the evaluation of pancreatic lesions. In addition, various contrast agents in use are directed toward opacification of the alimentary tract-ferritin, Gd-DTPA, manganese chloride, etc. MR agents for imaging the lungs (ventilation agents) include perfluorinated gases, gadolinium-based aerosols, and hyperpolarized helium and oxygen gases. Currently available MR contrast agents are useful in the characterization of pathology and in depicting vascular anatomy. 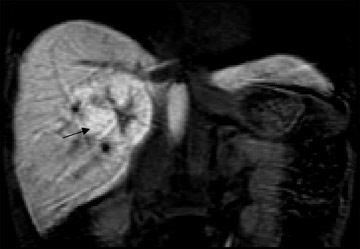 The new generations of MR contrast agents are more tissue-specific and may prove to have a profound impact on the imaging evaluation of various pathologies. MR contrast agents. Appl Radiol.